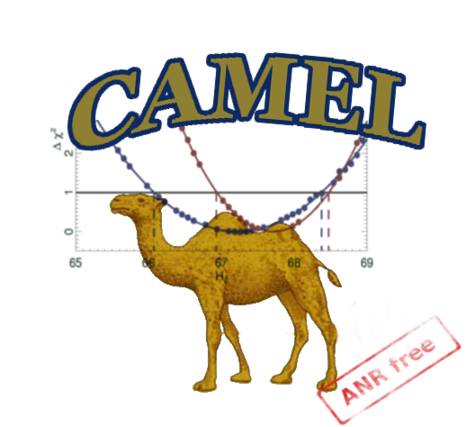 The general philosophy of CAMEL is that it is not a black-box: it is an opportunity to learn (and control) each step of cosmological parmeter estimation. All the outputs are available as plain ascii files and we do not provide low-level tools to read and display them. Some common utlities are however provided as script files and a python library ( work/tools/python/camel.py ) to ease MCMC analysis. Recall that the final best-fit values are available in the text file provided in the Minimize call. If you further specified a name to it you also have access to a standalone written Hessian matrix. The profile likelihood curve of a given parameter (θ) is the concatenation of "best fits" made for different fixed values of this very θ. Analysing a profile likelihood is therefore rather easy. A python utility software is available within CAMEL (in work/tools/python/draw_profile.py) which allows to do so. This will give you the results of the profile using an spline interpolation to compute the shape of the χ2 at its minimum. creation is made using the path of the head directory and the name of the variable. It will look for all the profiled-value and return the minimum χ2 found in each case. fit the profile using different modes (“cubic”:1D-interpolation, “spline”, “polyfit”:with defined order, default=3). Δχ2 max used for the fit can be defined through the parameter deltaMax. The fit returns (xmin, (xlow,xhigh)) but can also deal with upper-limits using the option upper=True and return CL=95% (with FeldmanCousin regularisation). An example of how to use the camel.py library when you want to compare the output of two MCMC runs (the so-called Triangle Plot). ### To compare several runs, create as many "MCsamples"
We provide a few IDL routines to analyze your chains output. They make use of sone astron features. then converts the files into a single fitsout FITS file (this will show you also trace plots).